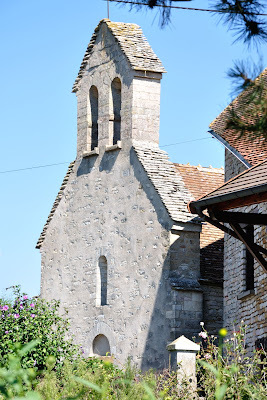 The first time we ever heard of Saint-Forgeuil (in the commune of Bresse-sur-Grosne) was through two of our our gîte guests, fanatic cyclists, who made long trips along the Voie Verte and the signposted "boucles" in this area. 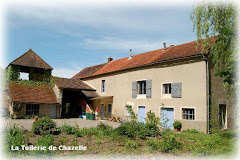 One fine day they returned from one of their trips, all flustered, because they had found another tuilerie, not far from here, in the hamlet of Saint-Forgeuil. We knew most of the tuileries around here, but this one was new to us. The owner happened to be a Belgian, also interested in industrial archaeology, who happened to know about even more brick factories in the area of which we were not aware. 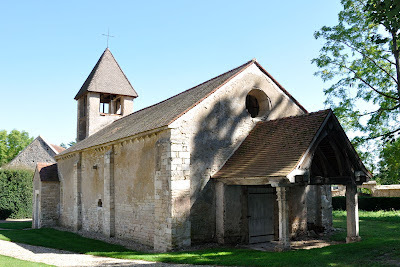 On le site sur l'Art Roman en Bourgogne I found reference to a Romanesque church dedicated to Saint-Ferréol, reason enough to revisit Saint-Forgeuil. The church was a tiny rectangular building, with a bell gable not dissimilar to those one sees often in Provence. It was impossible to walk around the church, because there was a house on either side of the church, and the space between house and church was closed with a gate; hence it was impossible to make a nice overall picture of the church. Despite this, we could add another interesting church to our list of visited churches. In front of the altar lies a tombstone, on which the writing is illegible. 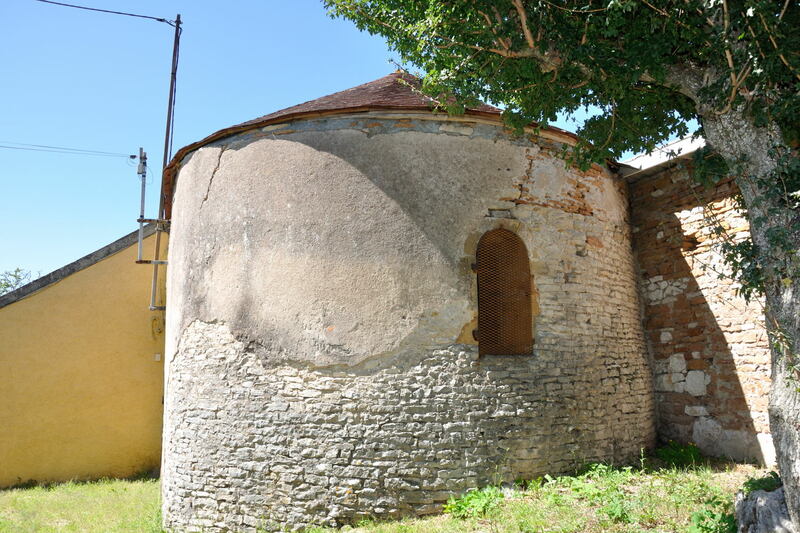 Legend has it that it covers the tomb of a bishop; more likely it is the tombstone of the last Dame of Brancion, Fauquette de l'Épervière. For some more pictures of the church, click here. The village of Sercy is better known with us as the threshold village. The first thing one sees when one enters the village is a speed reduction sign of 30 km/h, and that sign certainly is very useful. If you even dream of crossing the many speed ramps in the village at 32 km/h, afterwards you can drive straight away (if at all possible) to the nearest garage to have new shock absorbers fitted. Reducing speed here has another advantage; from the through going road one has a stunning view of the Sercy castle. 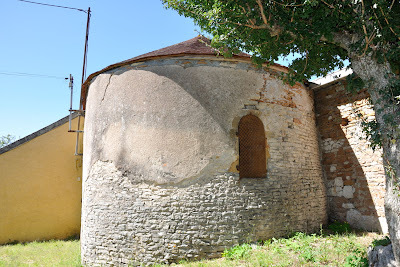 The castle is located next to the church, reason why I thought that reference to the castle chapel on le site sur l'Art Roman en Bourgogne was referring to this church. However, the first stone for this church was laid in 1846, so it simply could not be very Romanesque. Eduard however knew, that next to the castle there stood another, Romanesque chapel. 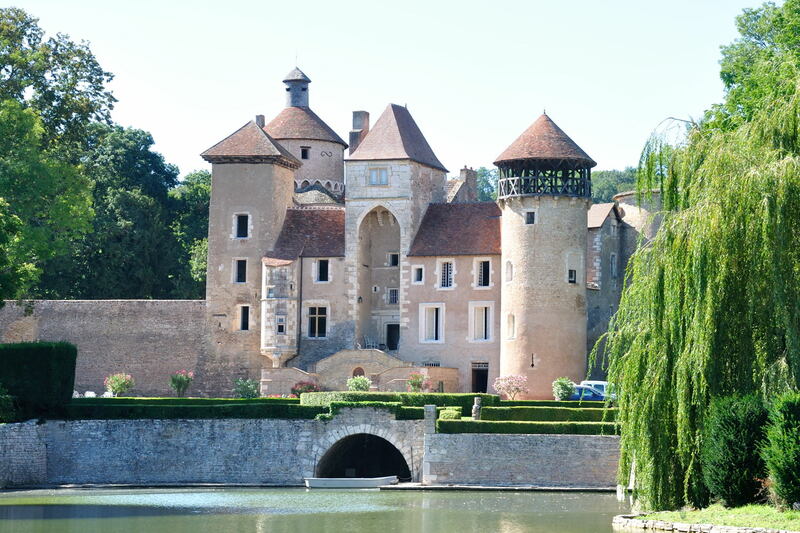 And even though the château is privately owned, the grounds around it are open to the public, the medieval kitchen of the castle at ground level can be visited, and the chapel is also accessible. 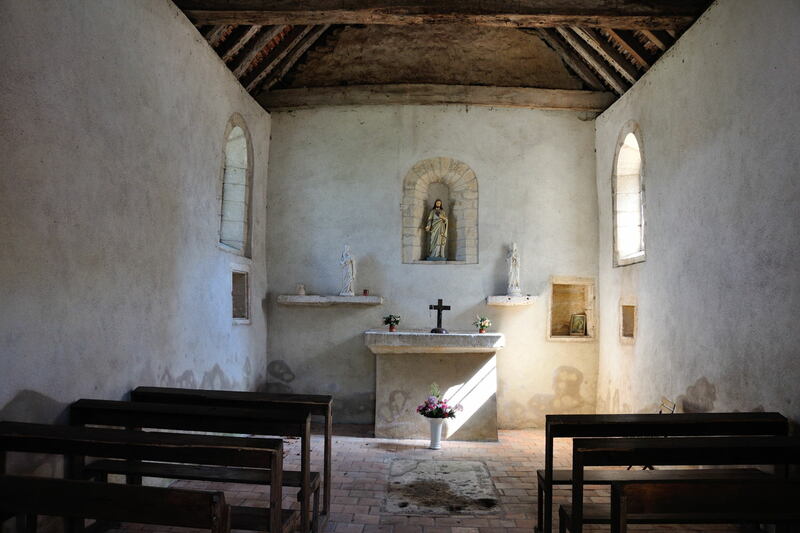 Until the new church was built, the chapel acted as the local parish church. Unfortunately the original arcade acting as bell tower has disappeared. The interior of the chapel is very gaudy, and though I do not know from which period these decorations are, they do not seem Romanesque to me. 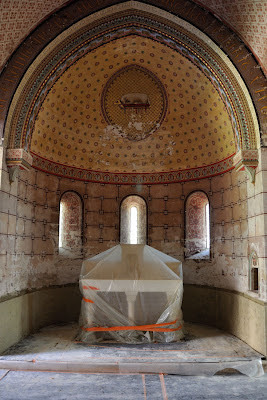 From other churches with similar decorations, for which the year is given on the information panels, I would say that the interior was (re-)decorated in the 19th century. However, I will happily accept a better opinion! For more pictures of château and chapel, click here. Of course it is fun to know something about a subject an expert on this subject does not know. 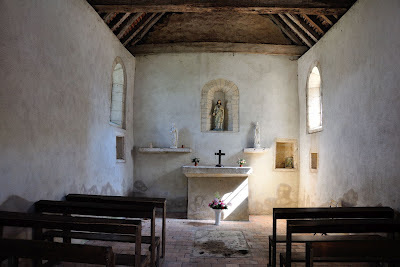 On the other hand, this is not so spectacular when realising that the field of expertise covers a huge area (in this case all Romanesque churches in Burgundy) and knowing that the "church" in question is built against a village hall in Cormatin, hidden away on the knoll Saint-Roch at the edge of the village. 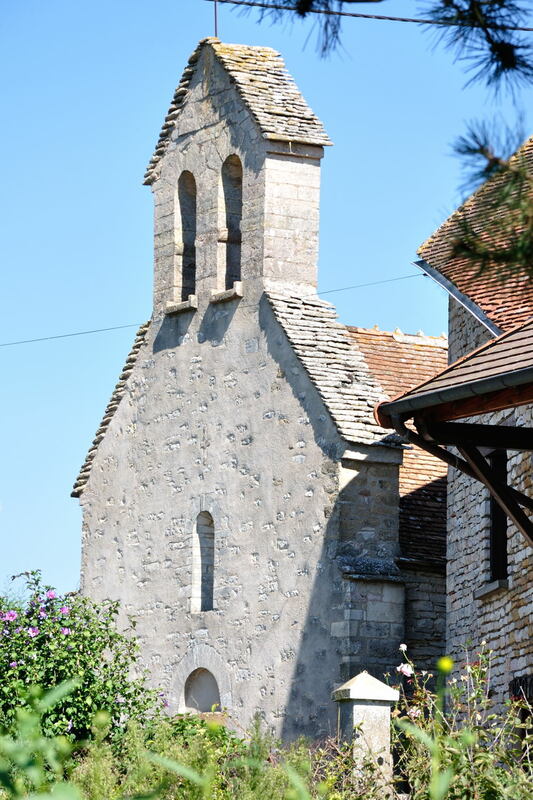 Because we are quite involved in all sorts of volunteer work in Cormatin, we regularly have to be in the village hall Saint-Roch. The hall is used for all sorts of festivities, such as the yearly dinner for the old age pensioners, the yearly bingo, the start of the yearly walks around Cormatin, etc. Tables have to be arranged and laid, chairs have to be set up, in a word, there is a lot to be done throughout the year. Tables and chairs are stored in a separate room. 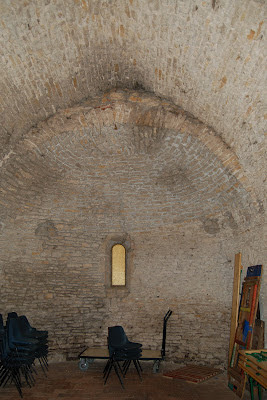 Only after all chairs and tables have been taken out, it becomes clear that the room is semicircular, and that it resembles a chapel. And that is what it once was, a chapel belonging to an old leper colony. Anyway, this proves that shifting tables and chairs can be instructive!